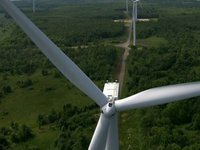 DTEK Energy Holding has signed a second contract with U.S. General Electric to supply equipment for Prymorska wind farm with a total capacity of 200 MW, the press service of the holding has reported. The first contract to supply equipment for Prymorska wind farm (100 MW) was signed in December 2017. It will be completed at the end of 2018. "Our ambitions are to build 1,000 MW of solar and wind power plants by the end of 2019. This is an ambitious goal requiring huge investments by the standards of Ukraine. The construction cost of such a capacity exceeds EUR1 billion," DTEK CEO Maksym Tymchenko said. DTEK Renewables is the operating company that manages DTEK's assets in the renewable energy sphere.